From Morocco to Malaysia and Los Angeles to London, the mosque in its many forms is the quintessential Islamic building. The first mosque was designed by the Prophet Muhammad himself (pbuh), within the courtyard of his home in Medina in the seventh century. It was a large courtyard (sahn) surrounded by long rooms supported by columns with a palm leaf covering to provide shade during prayer which could accommodate the local congregation when they assembled for Friday prayers. A mud-brick minbar or pulpit from which the call-to-prayer and the Friday sermon were delivered and, perhaps, mihrabs or recessed niches, indicating the direction to Mecca Sharif were the only features of the first mosque. 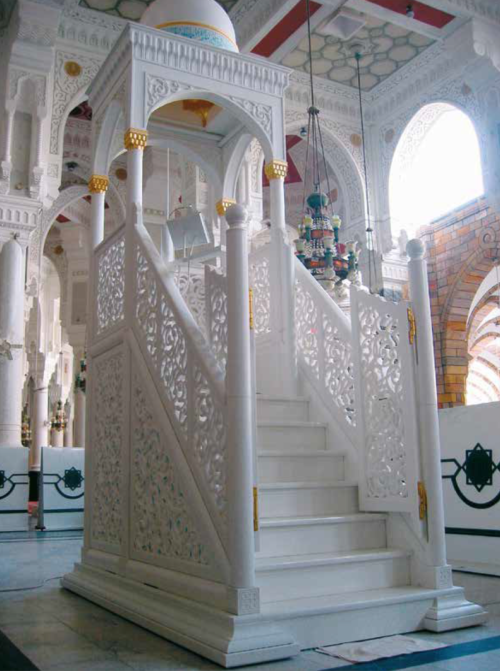 In the fourteen centuries that have followed, many designs and styles of decoration for mosques have been developed across the world. Available building materials and local art and architectural styles have influenced the design and decoration of these mosques, but they all share a common heritage and whether covered or uncovered, they have a courtyard where the faithful can assemble, an orientation and prayer wall facing Mecca, a minbar pulpit and minarets from where the call to prayer could be heard across the village, town or city. Over time, the walls, domes and minarets of the mosque become highly decorated incorporating three main decorative motifs: geometric, natural/vegetal and calligraphic, which incorporated inspiring verses from the Qur’an Sharif, the Islamic holy book. 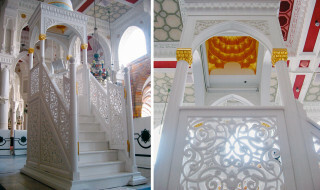 Today, as we enter the twenty-first century, many new styles of mosque architecture and decoration are appearing. 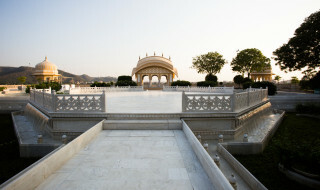 One of the leading architectural and design firms in the world, Saray Design based in Delhi, Jaipur and London have, over the years, created some of the most outstanding and original ornamentation and calligraphy for mosques drawing from the rich tradition of Islamic design and utilizing their extraordinary team of master marble carvers and inlay artisans. 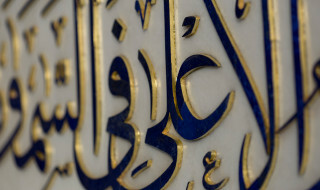 Saray’s projects include the Federal Territory Mosque of Kuala Lumpur, the Shaykh Zahed Grand Mosque in Abh Dhabi, the movable marble minbar for the Masjid Al-Haram in Mecca Sharif where the Saray artisans are currently working on the inlaid and gilded lapis calligraphy for the Al-Shamiya Extension of this most sacred site in the Islamic world. It is projects like these that keep these precious and endangered art and crafts traditions alive so that they can be passed on to future generations.